Samurai Shodown IV: Amakusa's Revenge, also known as Samurai Spirits: Amakusa's Descent (サムライスピリッツ天草降臨 Samurai Supirittsu Amakusa Kōrin, TenSamu in short) in Japan, is the fourth in SNK's flagship Samurai Shodown series of fighting games. Chronologically, it is the second and final chapter of a story between Samurai Shodown and Samurai Shodown II, with Samurai Shodown III being the first chapter. 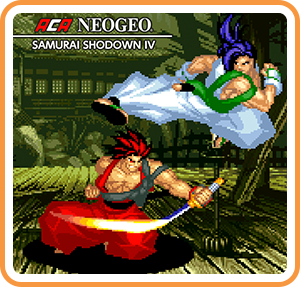 Where can I buy ACA NEOGEO SAMURAI SHODOWN IV physical/digital?